An important step in the campus development of the Leiden Bio Science Park! 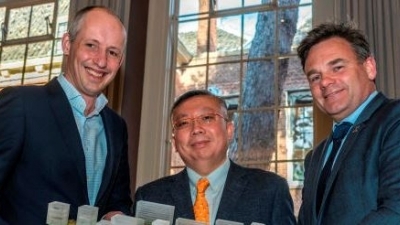 On Monday, March 18, 2019, Mr. Zhang of Yisheng Development, Martijn Ridderbos, vice-chairman of the Executive Board of Leiden University and alderman Paul Dirkse (Knowledge, Education, Sport and Finance) signed the final agreement for the development of the entrance area. In the new entrance area around the University Sports Center, between Plesmanlaan and Einsteinweg, there will be rental homes, shops, restaurants and other collective facilities. This creates a new heart of the Leiden Bio Science Park where residents, students, entrepreneurs and employees can meet. The development is now also referred to as the MORE plan. The entire new entrance area will probably be ready in 2023. For this development, Yisheng works together with various parties, such as architects, landscape architects, a real estate economist, sustainability and sound specialists and a student housing organization.